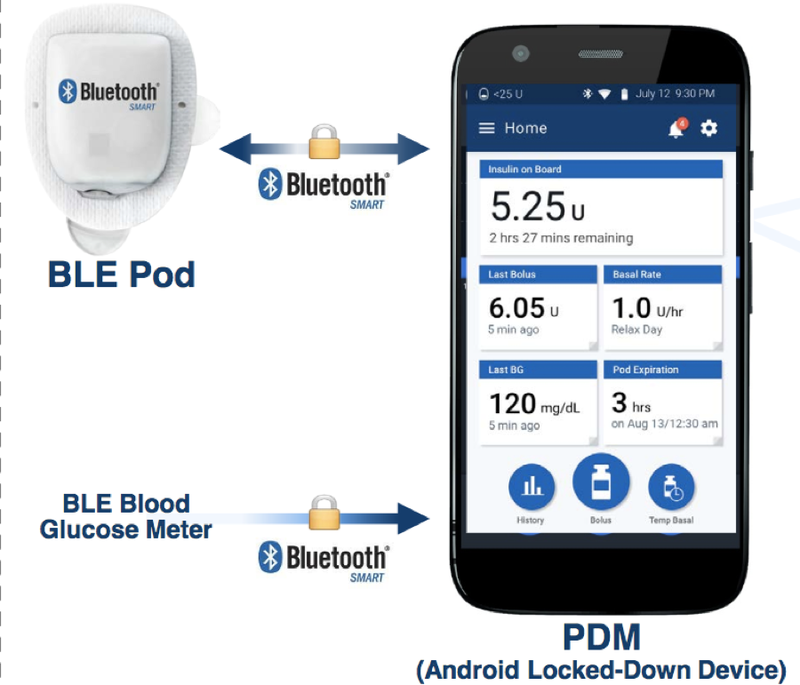 “Omnipod Dash” is expected to launch by the end of 2017 and will integrate Bluetooth into the body-worn, tubeless pod, and use a transformed, locked down Android smartphone for functions currently performed on the personal diabetes manager (PDM) handheld device. An Omnipod System designed to be used with concentrated Lilly U500 and U200 insulin (for those with higher insulin requirements) is expected to launch in the first half of 2019 and late 2019-early 2020, respectively. 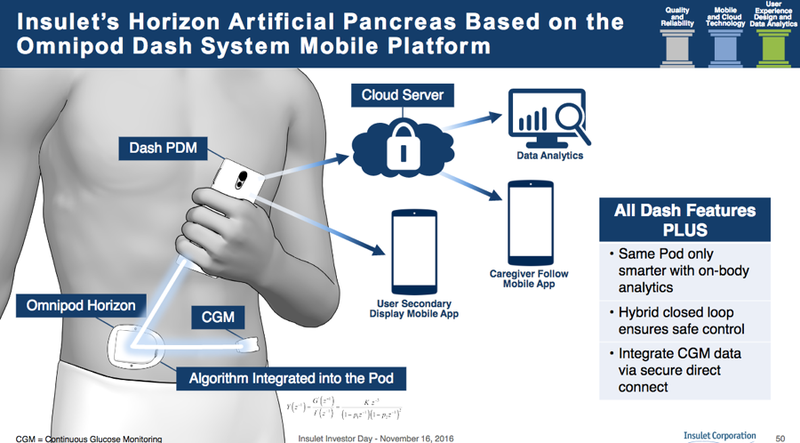 The Omnipod Horizon Automated Glucose Control System (to automate insulin delivery with Dexcom CGM) is slated for a “late 2019” launch. Read on below for details on each product. Insulet’s next big update, called Omnipod Dash, will add Bluetooth into the pod and finally bring a refresh to the personal diabetes manager (PDM) handheld device. A touchscreen Android phone will now become the Omnipod PDM, a big step up over the current handheld that looks very much like a medical device. The Android phone PDM will be “locked down,” meaning it will not have cellular capabilities, other apps, or an integrated blood glucose meter. It will use Bluetooth to communicate wirelessly with the pod (e.g., to deliver a bolus) and to talk to a Bluetooth-enabled glucose meter (brand not named). The Dash Android PDM will also communicate with a paired app on a user’s normal smartphone that will then relay pump data to caregivers (“followers”; see image above). Insulet expects to file for FDA clearance in mid-2017 and hopes to launch Dash by the end of 2017. Notably, all current Omnipod pumpers will have the option to transition to the new Dash system when it launches. Over time, the existing PDM will be phased out and all users will be transitioned to the new Dash platform. There are no pricing details to report. Dash will not allow users to bolus from their own smartphone, though perhaps Insulet and the FDA may pursue something similar down the road. Insulet has partnered with Lilly to develop Omnipod systems for more concentrated U200 and U500 insulins. These new Omnipod systems will be particularly valuable for people with higher insulin requirements because they can pack two (U200) to five (U500) times the glucose-lowering power of standard U100 insulin in the same reservoir space. Omnipod U200 will be applicable for users with a total daily dose of greater than 70 units of insulin; the U500 will be applicable for people with type 2 diabetes and a total daily dose of greater than 200 units of insulin. The big change is the addition of different software on the handheld PDM that is compatible with concentrated insulins – dosing these can be confusing and dangerous, so getting the human factors right is critical. Insulet has an ongoing trial of the U500 Omnipod and hopes to launch it in the first half of 2019. The U200 Omnipod is earlier in development and expected to launch in late 2019-early 2020. Insulet’s automated insulin delivery system is expected to launch in late 2019, with pivotal trials in late 2018-early 2019. 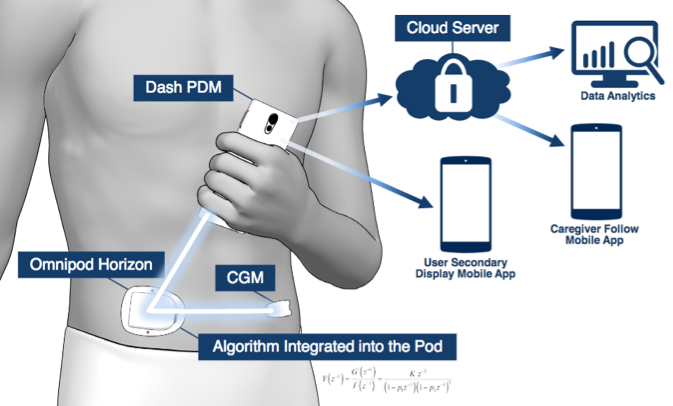 The on-body pod and Dexcom CGM will communicate with one another directly, meaning that users won’t need to have the handheld Dash PDM with them to remain in closed loop (see image) - a big advantage. Read more details on the Horizon System in diaTribe’s review of Automated Insulin Delivery in 2016.